If you have been involved in a motorcycle accident, Natalie Clarke can help. As a specialized personal injury lawyer with experience in motorcycle accident claims, Natalie will aggressively defend your case to get you the compensation that you are entitled to. Motorcycle drivers are often at higher risks on the road than other vehicles – even equipped with the appropriate gear and following the necessary safety precautions. 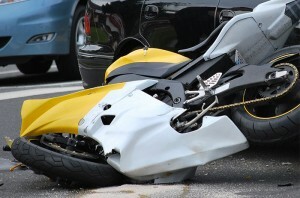 This vulnerability means the risk and seriousness of motorcycle accidents are greatly increased. Driving laws in Ontario allow a victim to fight for both accident benefits and compensation for vehicle damages. Natalie has the experience and expertise to ensure you understand your legal rights and the specific legal process. Natalie Clarke will work side-by-side with you and give you the highest level of legal guidance to see you through to a successful settlement. She will help you with everything from filing your claim with the insurance company, to taking legal actions against the at-fault party. Every claim is different. Without an experienced lawyer working on your behalf, you may find yourself making statements or leaving out details that can negatively affect your claim. The team of lawyers at Clarke Law have fought for injured clients in Toronto, the GTA, and all surrounding cities and communities. With offices conveniently located in the heart of Toronto for easy access, we also provide in-hospital and in-home consultations Natalie Clarke will take all necessary steps to successfully resolve your legal claims.